Leon Haslam stormed to his first win of the season after a dramatic wet Bennetts British Superbike Championship race two at Brands Hatch. The original race was red-flagged on the seventh lap as the light drizzle which had been falling at the start suddenly got harder, and the riders were sent back out onto the grid in the positions they had been in before the race was stopped. 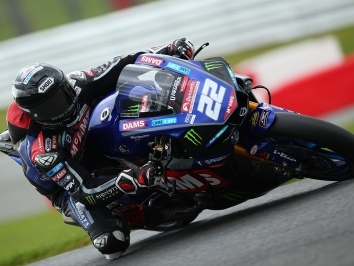 This meant Bradley Ray was on pole ahead of Leon Haslam, as Jake Dixon – who had made a lightning-quick start to move third, rounded out the front row. At the restart, Leon Haslam was quick off the mark and shot into the lead, as Ray dropped back and his Buildbase Suzuki team-mate Richard Cooper came through to third. Christian Iddon moved past Ray into third, closely followed by Jake Dixon, as Cooper pushed his way to the front, to lead the opening few laps. Haslam battled his way back past with a move around the outside at Graham Hill Bend on lap five to lead, but by lap 10 of 22, Tyco BMW’s Michael Laverty had sliced his way through into the lead. But it was all change in the chasing pack as Irwin was also on a charge up the order, shuffling the front five as he moved past Be Wiser Ducati team-mate Shane Byrne. Moments later, Haslam regained traction and passed Dixon, but the RAF Regular and Reserves Kawasaki rider hit the deck on the Cooper Straight after an attempt up the inside of the JG Speedfit Kawasaki man. It was a clear three-way fight for victory as Laverty, Irwin and Haslam battled out front all the way to the finish. Irwin made a move on Laverty two laps from the finish to put the Panigale in front, then Haslam followed him through to take second. With one lap to go, Laverty took himself out of contention for victory as he ran wide at Druids, just before Haslam dived up the inside of Irwin at Surtees to take the lead only for the Ducati man to pass him right back at Clearways. But a win wasn’t to be for Irwin as Haslam passed him once again and held the lead over the line to take his first win since Assen last year. 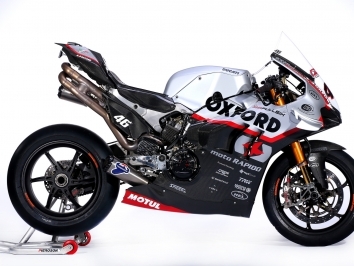 Laverty settled for third ahead of Byrne, while McAMS Yamaha’s Josh Brookes fought through to take fifth. Iddon bagged sixth from championship leader Ray in seventh and Movuno.com Halsall Racing Suzuki’s Tommy Bridewell in eighth. Ninth went to series rookie Taz Mackenzie ahead of fellow Superbike newcomer Carl Phillips on the Gearlink Kawasaki.